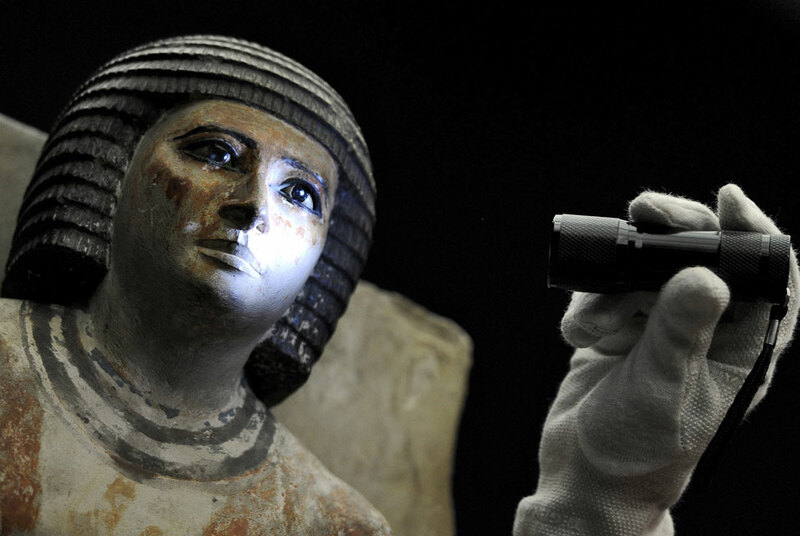 A restorator illuminates the face of the statue of Kai, an ancient Egyptian territorial civil servant, with a torch light during the preparations for an exhibition at the Liebighaus in Frankfurt/Main, Germany. The exhibition 'Sahure - Death and Life of a great Pharaoh' wil open to the public from 24 June to 28 November. Sahure reigned as king of ancient Egypt's 5th dynasty between 2458 and 2446 BC. Sahure stood out politically and culturally and is a prominent representative of the so-called Old Kingdom. EPA/MARIUS BECKER. FRANKFURT.- From June 24 to November 28, 2010 the Liebieghaus Skulpturensammlung will present the exhibition Sahure  Death and Life of a Great Pharaoh. Ruling Egypt from about 2428 to 2416 BC, Sahure was a both politically and culturally outstanding king of the Fifth Dynasty and thus a prominent representative of the Old Kingdom, the Age of the Pyramids. Amongst all known pyramid complexes, that of Sahure in Abusir near Cairo, which boasts several superlatives, takes a special position. The intricate architecture with a total length of just under 500 meters reveals a pure, classical form of strict axiality and perfection. The walls are decorated with 10,000 square meters of royal relief art. The finds made so far can be assembled to the most beautiful and abundant picture book of the Old Kingdom. With high-caliber originals  reliefs, architectural elements, sculptures, vases, and valuable papyruses  from international museums such as the Musée du Louvre in Paris, the Egyptian Museum and Papyrus Collection in Berlin, and the Metropolitan Museum of Art in New York, the show gives evidence of the worship this great Egyptian pharaoh enjoyed. A special chapter of the exhibition will be dedicated to the scientist and explorer Ludwig Borchardt, who discovered Sahures pyramid complex in the early twentieth century and from whose excavations important reliefs from Sahures temple complex came into the possession of the Liebieghaus in the course of the finds distribution. Historical documents, diaries, and drawings convey a comprehensive picture of the fascinating excavation history of Sahures pyramid temple which began more than one hundred years ago and still continues today. The Liebieghaus Skulpturensammlung in Frankfurt holds a small, but important collection of art from Ancient Egypt. The objects from the Old Kingdom, the epoch spanning from the Third Dynasty to the Sixth Dynasty (c. 25432120 BC), merit special attention. The Old Kingdom is not only the era of the great pyramid builders, but also a period in which the concepts of belief and the hereafter  and particularly their imagery  were elaborated and completed. The works made under Pharaoh Sahures reign are to be regarded as an apex in this essential phase. Combining numerous unparalleled features, the pyramid complex built for Sahure about nine kilometers south of the Cheops Pyramid provided an important model for subsequent pyramids. The 500-meter-long complex comprises a valley temple, a causeway, a pyramid temple, and a sanctuary  the inner sanctum or offering room  abutting upon the pyramid with the pharaohs burial chamber. The burial procession reached the splendid valley temple by festive boats on Nile canals. The bereaved walked through the magnificent architecture along a gigantic 235-meter-long causeway  a closed corridor, which, together with the adjacent suites, was decorated with more than 10,000 square meters of colored reliefs  until it reached a long entrance hall. According to Ludwig Borchardt, this hall served as the last station before the burial. From here, people entered the pyramid temple. After passing a granite gateway, the festive company stepped into a central open courtyard lined with sixteen columns supporting a granite architrave and surrounded by a closed corridor. A transverse corridor was to be found at its western end. It separated the public area of the temple from the intimate part only accessible to the priests. The sanctuary was to be found beyond a chamber with five statue niches and two anterooms. Directly adjoining the pyramid, the offering room was exactly situated in the axis of the ensemble. According to the belief of Ancient Egypt, its false door was to permit Sahures ghost to enter the pyramid and take the meal offered to him there as a sacrifice. Like the other buildings of the burial site, the pyramid temple followed a strict symmetry and showed a harmonious color symbolism in the decoration of its rooms. The ensembles reliefs are regarded as the largest and most beautiful picture book of Egypt realized by the most talented sculptors of that time. Revealing a remarkably resourceful narrative power and a programmatic range which was to establish a canon for years to come, the reliefs unfold an account of the construction of the complex called Sahures Soul Shines, the rulers glorious deeds, the gods affection for the great pharaoh, but also of the extremely lavish cult for the dead king. Numerous reliefs on display in the exhibition will convey a vivid impression of this. The only known and well preserved statue of Pharaoh Sahure from the collections of the Metropolitan Museum of Modern Art in New York will provide a further highlight of the show. The statue depicts Sahure, flanked by a personification of a nome god, sitting on a throne. The execution of the royal portrait as a likeness with accentuated features differs from the majestic elegant pharaohs of the Fourth Dynasty and marked the beginning of a new epoch of royal portraiture. In addition, the exhibition also presents both valuable and enlightening papyruses from the area of the pyramid ensemble of Abusir. These rich literary treasures of Ancient Egypt constitute the most important official texts of the Old Kingdom and provide a first insight into the instruments and materials used for the ceremonies and rites conducted on the pyramid burial site. They serve as an authentic subtext, as it were, to the numerous reliefs representations. In the Fifth and Sixth Dynasties, the number of relief works in the burial complexes considerably increased in comparison with the large pyramids of the Fourth Dynasty, while the size of the pyramids decreased. This decrease  Sahures pyramid had a side length of 78.8 meters and an original height of 47.3 meters  was probably caused by the declining supply with dimension stone. A historical model after plans by Ludwig Borchardt from 1910 as well as the exhibition architecture will make it possible to grasp the structure of the pyramid complex. Crucial original constructive elements such as a mighty capital of the elegantly formed red granite architecture from the pyramid temples central courtyard, architraves, statues, a false door, and impressive reliefs convey a mesmerizing impression of the ensemble. The exhibition strikingly illustrates that there was more to the entombment sites of the Old Kingdom than just pyramid volumes and that festivities and offerings were celebrated in the generous complexes connecting the fertile Nile alley with the burial grounds on the desert plateau. The kings of the Fifth Dynasty share a new notion of their descent from the sun god Ra, the most powerful deity. This new notion derived from changes that can already be seen to emerge in the Fourth Dynasty. The Westcar Papyrus, one of the most famous documents of Egyptian culture, tells us that Sahure was fathered by Ra and given birth by a mortal woman. Considering this we will find it less sursprising that Userkaf, Sahures predecessor, Sahure himself, and his successors Neferirkare Kakai, Neferefre, Nyuserre Ini, and Menkauhor Kaiu had not only built their own funerary temples on the deserts fringe, but also erected stupendous edifices for the sun god. One cult center was not enough, each son had his own place of worship erected for his divine father and thus established a direct relationship between himself and god. This goes to show that pyramids and sun temples constituted a contentual and constructive entity. The sun temple of Sahure mentioned in the texts has not been discovered so far. A special section of the exhibition in Frankfurt will shed light on the sun temple of Pharaoh Nyuserre Ini  the only well-preserved and investigated site. Another section of the exhibition will be dedicated to Ludwig Borchardt (1863, Berlin  1938, Paris), the archaeologist who discovered Nefertiti and is regarded the most successful and productive explorer in German Egyptology. Borchardt excavated and investigated the pyramid complex of King Sahure in 1907, more than a hundred years ago. He and his wife lived in Cairo for forty years. In 1907 he founded the Deutsches Institut für Ägyptische Altertumskunde, as whose director he served until 1929. In 1931 he set up the Ludwig-Borchardt-Institut, from which todays Schweizerisches Institut für Ägyptische Bauforschung und Altertumskunde developed, which is still financed by the foundation established by Borchardt in Switzerland. Mimi Borchardt, a native of Frankfurt, attentively accompanied her husbands activities, which she supported with her familys financial resources. Mimis mother came from the wealthy German-American Kuhn family, a family of bankers. Her father, Eduard Cohen, was an influential member of the Frankfurt society, a respected painter, and founding member of the Städelsche Museumsverein. According to the laws of the Service des antiquités dEgypte in force in the early twentieth century, half of the finds from Borchardts excavations in the royal necropolis of Abusir were transferred to Germany. The German Oriental Society, which had financed Borchardts excavations, entrusted most of the finds to various German museums and university collections. After Berlin, Frankfurt received an especially important group of works comprising the famous statue of Userkaf and particularly beautiful reliefs from the funerary temple. In the turmoil of World War I the German Egyptologists lost their excavation license for Abusir. It was only after World War that work was resumed in the royal and the court officials tombs of Abusir  this time by Egyptologists of the Prague Charles University. These excavations were very successfully supervised by Miroslav Verner for several decades. Zahi Hawass, Secretary General of the Supreme Council of Antiquities, enjoyed an extraordinarily good fortune, when he and his assistant Tarek El-Awady discovered a number of large limestone blocks with outstanding reliefs surviving on their inner sides to the left and to the right of the causeway in the course of work on the ruin of Sahures pyramid complex in 1994. These blocks are still in the position they were found, have been protected by brick walls, and will soon be transferred to the museum in Gizah. Further reliefs, which have not been excavated yet, have already emerged under the uncovered blocks. As soon as the most recent finds will have been taken away, the fascinating story of Sahures burial site is bound to continue.